"Yastrzemski" redirects here. For other people with this surname, see Yastrzemski (surname). Carl Michael Yastrzemski (/jəˈstrɛmski/; nicknamed "Yaz"; born August 22, 1939) is an American former Major League Baseball player. He was elected to the Baseball Hall of Fame in 1989. Yastrzemski played his entire 23-year Major League career with the Boston Red Sox (1961–1983). He was primarily a left fielder, but also played 33 games as a third baseman and mostly was a first baseman and designated hitter later in his career. Yastrzemski is an 18-time All-Star, the possessor of seven Gold Gloves, a member of the 3,000 hit club, and the first American League player in that club to also accumulate over 400 home runs. He is second on the all-time list for games played, and third for total at-bats. He is the Red Sox' all-time leader in career RBIs, runs, hits, singles, doubles, total bases, and games played, and is third on the team's list for home runs behind Ted Williams and David Ortiz. In 1967 Yastrzemski achieved a peak in his career, leading the Red Sox to the American League pennant for the first time in over two decades and being voted the 1967 American League MVP. Yastrzemski also won the Triple Crown that year, a milestone which was not accomplished again in the Major Leagues until Miguel Cabrera achieved the feat 45 years later in 2012. Yastrzemski was born in Bridgehampton, New York to Carl Yastrzemski, Sr. and Hattie Skonieczny. Both his parents were of a Polish background, and young Carl was bilingual from an early age. Raised on his father's potato farm, Carl played on sandlot baseball teams with his father, who, he maintains, was a better athlete than he was. Carl also played Little League Baseball. "Yaz" attended Notre Dame on a basketball scholarship (his career Long Island high school scoring mark at Bridgehampton broke one previously held by Jim Brown) briefly before embarking on his baseball career. 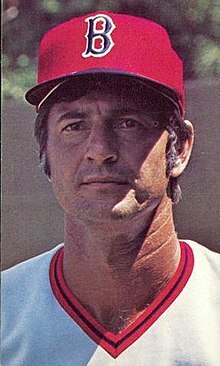 Yastrzemski signed with the Red Sox organization, which sent him to the minor-league Raleigh Capitals in 1959, where he led the league with a .377 batting average, They then moved him to the Minneapolis Millers for the post-season and the 1960 season. Yastrzemski, who had studied business at Notre Dame, fulfilled a promise to his parents by finishing his degree at Merrimack College in North Andover, Massachusetts, in 1966. Yastrzemski began his major-league career in 1961 and hit his first home run off of former Red Sox pitcher Jerry Casale. From the beginning, there was tremendous pressure on him to perform, as he succeeded to the position of the great Red Sox legend Ted Williams. He would prove to be a worthy successor at the plate, and a far superior defensive player with a strong arm, expert in playing off the Green Monster, Fenway Park's left-field wall. In 12 years as a left fielder, Yastrzemski won seven Gold Gloves and led in assists seven times. Yastrzemski enjoyed his best season in 1967, when he won the American League Triple Crown with a .326 batting average, 44 home runs (tied with Harmon Killebrew) and 121 RBIs. Yastrzemski's Triple Crown win in 1967 was the last time a major league hitter won the Batting Triple Crown until Miguel Cabrera in the 2012 season – conversely six different pitchers have since won the pitchers' version. He was voted Most Valuable Player almost unanimously (one voter chose César Tovar of the Twins). His 12.4 WAR was the highest since Babe Ruth's 1927 season. The Red Sox lost the World Series four games to three to the St. Louis Cardinals, losing three times to Bob Gibson. However, Yaz batted .400 with 3 home runs and 5 RBI in the series. In that season, Yastrzemski also won the Hickok Belt as top professional athlete of the year and Sports Illustrated magazine's "Sportsman of the Year" Award. Yastrzemski bats at Fenway Park. In 1968 Yastrzemski again won the batting championship. Because of the competitive advantages pitchers enjoyed between 1963 and 1968 (prior to the lowering of the pitcher's mound), Yastrzemski's .301 mark in "The Year of the Pitcher" is the lowest average of any batting champion in major league history; however, he was the only hitter in the American League to hit .300 for that season against such formidable pitching, as well as leading the league in on-base percentage and walks. In 1969, Yastrzemski had the first of two consecutive 40-home run seasons as he led the Red Sox to third-place finishes that year and the next. He got four hits, tying the record, and won the All-Star Game MVP in 1970, although the American League lost. He is one of two players to win the All-Star Game MVP Award despite playing for the losing team, Brooks Robinson having done so in 1966. Yastrzemski's .329 batting average that season was his career high, but he finished second behind the California Angels' Alex Johnson for the batting title by less than .001. In 1970 Yaz led the league in slugging and on-base percentage, finishing third in home runs. Although he hit but 61 home runs over the next four years (1971 through 1974) as the Red Sox finished second twice and third twice, he finished in the top 10 in batting, and top three in on-base percentage and walks in 1973 and 1974, and led the league in runs scored in 1974. 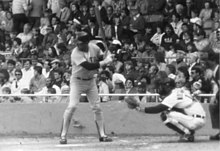 Yastrzemski and the Red Sox would suffer another World Series loss in 1975, losing four games to three to the Cincinnati Reds. Yastrzemski made the final out in Game 7 on a fly out to center, trailing by one run. Coincidentally, he also made the final out of the 1978 American League East tie-breaker game with a foul pop to third base. This game featured Bucky Dent's famous homer (although Reggie Jackson's home run was the eventual winning run). Earlier in the game, however, Yastrzemski began the scoring with a home run off left-handed pitcher Ron Guidry, who was having a career year (25 wins, 3 losses and a 1.74 ERA). It was the only homer the Cy Young Award winner allowed to a left-hander all season. On May 19, 1976, Yastrzemski hit three home runs against the Detroit Tigers at Tiger Stadium. He then went to Yankee Stadium and hit two more, tying the major league record of five home runs in two consecutive games. In 1978 Yastrzemski, then 39, was one of the five oldest players in the league. On September 12, 1979 Carl Yastrzemski achieved another milestone becoming the first American League player with 3000 career hits and 400 home runs. In 1982, playing primarily as a designated hitter, an early season hitting streak placed him among the league's leading hitters and saw him featured on the cover of Sports Illustrated and played in that year's All-Star game. Carl Yastrzemski's number 8 was retired by the Boston Red Sox in 1989. Yastrzemski retired in 1983 at the age of 44, although he stated in his autobiography Yaz that he was initially planning on playing the 1984 season, until he was tired from a long midseason slump. He also stated that had he known how good Roger Clemens would have been as a pitcher, he would have played in 1984 to have had a chance to play with him. No player has had a longer career with only one team, 23 seasons, a record which he shares with Brooks Robinson of the Baltimore Orioles. His final career statistics include 3,308 games played (second all-time and the most with a single team), 646 doubles, 452 home runs, 1,844 RBIs, and a batting average of .285. He had 1,845 walks in his career, and 1,157 extra base hits. Yastrzemski was the first player to ever collect over 3,000 hits and 400 home runs solely in the American League (the feat has since been accomplished by Cal Ripken Jr.). He was named to the All-Star Game 18 times. Yastrzemski won three American League batting championships in his career. In addition, Yastrzemski only trails Ty Cobb and Derek Jeter in hits collected with a single team, and trails only Cobb, Jeter and Tris Speaker in hits collected playing in the American League. Yastrzemski is also Fenway Park's all-time leader in hits, doubles, and RBI's. By the time of his retirement, he was the all-time leader in plate appearances, since surpassed by Pete Rose. 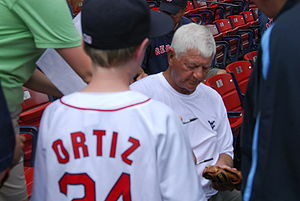 Yastrzemski signing an autograph at Fenway Park in 2008. As one of the top players of his era, he was elected to the Baseball Hall of Fame in 1989, his first year of eligibility, with the support of 94% of voters. Notably, this makes him one of the few Hall of Famers to directly succeed another Hall of Famer at the same position. For his entire career with the Red Sox, he wore uniform number 8. The Red Sox retired this number on August 6, 1989, after Yastrzemski was elected to the Hall of Fame. In 1999, Yastrzemski ranked number 72 on The Sporting News' list of the 100 Greatest Baseball Players. That same season, he was named a finalist to the Major League Baseball All-Century Team. Prior to his induction in the Baseball Hall of Fame, in 1986, Carl Yastrzemski was inducted into the National Polish-American Sports Hall of Fame. Yastrzemski was well known for his batting stance, holding his bat exceptionally high, giving his swing a large, dramatic arc (unexpectedly so for a well-known "fastball hitter"), and more power at the plate. However, in his later years, he adjusted his stance and held the bat lower. He was also known for modifying his batting helmets by enlarging the right ear hole (for comfort) and removing part of the right ear flap (for better vision of the ball as it was being pitched). He also stood out for his cagey approach to the game. He would decoy opposing baserunners with his left-field play. On fly balls headed for Fenway's Wall, he would line up as if about to make the catch just in front of the wall, waiting until the last possible moment before wheeling around to play the carom. This would fool baserunners into tagging up for precious extra seconds, preventing them from taking an extra base, and if they tried anyway his deft handling of the bounce and accurate throwing arm were liable to make them pay the price. Once while running the basepaths himself, Yastrzemski found a unique way to induce a throwing error. Thrown out at second base, he failed to head immediately for the dugout, as is customary. Opponents made an protracted attempt at tagging out another runner in a rundown or "pickle", but soon were flabbergasted to see a Red Sox player rounding third and heading for home. A panicked throw to the catcher far missed the mark, allowing Yastrzemski to "score" but more importantly allowing the runner behind him to advance. A record album of the Red Sox's 1967 season, aptly titled "The Impossible Dream", featured a song by DJ Jess Cain of praise for "The man they call Yaz", which included the line "Although 'Yastrzemski' is a lengthy name / It fits quite nicely in our Hall of Fame." (A link to the song appears below.) The song can be heard, and the album cover can be seen, in the apartment of Ben Wrightman (played by Jimmy Fallon) in the 2005 film Fever Pitch. Earlier in the film, Ben's girlfriend, Lindsay Meeks (Drew Barrymore), not yet familiar with the triumphs and tribulations of the Red Sox, is unable to properly pronounce Yastrzemski's name, and has to be corrected by the surrounding fans: "Ya-STREM-ski!" The final scene of the movie indicates that if the couple's unborn child is a girl she will be named "Carla Yastrzemski Wrightman." Along with Johnny Pesky, Yastrzemski raised the 2004 World Series championship banner over Fenway Park. He is currently a roving instructor with the Red Sox, and was honored by throwing out the ceremonial first pitch for Game 1 of the 2004, 2007, 2013, and 2018 World Series. In August 2008, Yastrzemski underwent successful triple bypass heart surgery at Massachusetts General Hospital. The Red Sox honored Yastrzemski with a statue of him outside Fenway Park on September 23, 2013. Yastrzemski's son Mike Yastrzemski was drafted by the Atlanta Braves in the third round in 1984. He started his career with the Durham Bulls and then eventually played for two AAA-affiliate Chicago White Sox teams in the Pacific Coast League, first with the Hawaii Islanders and then the Vancouver Canadians. He died of a heart attack in 2004 at age 43. In June 2009, Boston drafted Carl's grandson Michael, an outfielder out of St. John's Prep, in the 36th round; Michael did not sign with the team and went to Vanderbilt. In 2012, Michael was drafted by the Seattle Mariners in the 30th round, with the 911th overall pick. He signed with the Baltimore Orioles as their 14th round pick in 2013. While with the Aberdeen IronBirds, he started in the 2013 New York–Penn League All-Star Game. Michael started the 2015 season with the Double-A affiliate Bowie Baysox. In May 2016, Michael was moved up to the Triple-A affiliate Norfolk Tides. He split time during the 2017 season with the Tides (81 games) and Baysox (20 games). Through the end of the 2017 season, on the all-time lists for Major League Baseball, Yastrzemski ranks first for games played for one team, second for games played, third for at-bats, sixth for bases on balls, eighth for doubles, ninth for hits, ninth for total bases, thirteenth for extra-base hits, and fourteenth for RBIs. ^ a b "Official Yastrzemski Web Bio". yaz8.com. Archived from the original on 2000-06-21. Retrieved 2008-07-25. ^ a b "Carl Yastrzemski". ^ a b c d e f g "Carl Yastrzemski Stats - Baseball-Reference.com". Baseball-Reference.com. ^ a b "1967 American League Batting Leaders - Baseball-Reference.com". Baseball-Reference.com. ^ a b "1967 Awards Voting - Baseball-Reference.com". Baseball-Reference.com. ^ "2017 Register Batting Leaders - Baseball-Reference.com". Baseball-Reference.com. ^ "Minneapolis Millers history". Retrieved 2008-07-25. ^ "Yaz won Triple Crown". ESPN.com. Retrieved 2008-07-25. ^ "The Ballplayers – Carl Yastrzemski". BaseballLibrary.com. Archived from the original on 2008-10-06. Retrieved 2008-07-25. ^ "MLB American League Gold Glove Award Winners - Baseball-Reference.com". Baseball-Reference.com. ^ "1963 American League Batting Leaders - Baseball-Reference.com". Baseball-Reference.com. ^ "1963 Awards Voting - Baseball-Reference.com". Baseball-Reference.com. ^ a b "1967 American League Season Summary – Baseball-Reference.com". Baseball-Reference.com. ^ Dan Shaughnessy (August 1992). "Triple Crown Season in '67 Marked High Point for Yaz". Baseball Digest. Vol. 51 no. 8. ISSN 0005-609X. 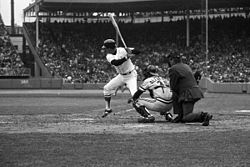 ^ "1967 World Series – St. Louis Cardinals over Boston Red Sox (4-3) – Baseball-Reference.com". Baseball-Reference.com. ^ "Carl Yastrzemski – Behind the Red Sox Turnaround – SPORT magazine". thesportgallery.com. Archived from the original on 2008-07-04. Retrieved 2008-07-25. ^ a b "1968 American League Batting Leaders - Baseball-Reference.com". Baseball-Reference.com. ^ "1970 All-Star Game Box Score, July 14 - Baseball-Reference.com". Baseball-Reference.com. ^ a b "1970 American League Batting Leaders - Baseball-Reference.com". Baseball-Reference.com. ^ "1973 American League Batting Leaders - Baseball-Reference.com". Baseball-Reference.com. ^ "1974 American League Batting Leaders - Baseball-Reference.com". Baseball-Reference.com. ^ "1975 All-Star Game Box Score, July 15 - Baseball-Reference.com". Baseball-Reference.com. ^ "1975 World Series - Cincinnati Reds over Boston Red Sox (4-3) - Baseball-Reference.com". Baseball-Reference.com. ^ "1975 World Series Game 7, Cincinnati Reds at Boston Red Sox, October 22, 1975 - Baseball-Reference.com". Baseball-Reference.com. ^ a b "New York Yankees at Boston Red Sox Box Score, October 2, 1978 - Baseball-Reference.com". Baseball-Reference.com. ^ "Boston Red Sox at Detroit Tigers Box Score, May 19, 1976 - Baseball-Reference.com". Baseball-Reference.com. ^ "Yastrzemski Recalls His Most Memorable Games, by Peter Gammons, Baseball Digest, September 1981, Vol. 40, No. 9, ISSN 0005-609X". ^ "Boston Red Sox at New York Yankees Box Score, May 20, 1976 - Baseball-Reference.com". Baseball-Reference.com. ^ "1978 American League Awards, All-Stars, & More Leaders - Baseball-Reference.com". Baseball-Reference.com. ^ Pepe, Phil (2005). Catfish, Yaz, and Hammerin' Hank: The Unforgettable Era that Transformed Baseball. Chicago, Illinois: Triumph Books. p. 313. ISBN 978-1-57243-839-2. ^ a b c "History: Retired Numbers". Boston Red Sox. ^ "The All-Century Team". Major League Baseball. ^ Kepner, Tyler (April 12, 2005). "With Rings and Then a Rout, It's a Great Day for the Red Sox". The New York Times. ^ a b Amore, Dom (August 12, 2013). "Mike Yastrzemski Carrying Family Name to New York-Penn All-Star Game". The Hartford Courant. Retrieved August 31, 2013. ^ "Mike Yastrzemski Minor & Fall League Statistics & History". Baseball-Reference.com. Retrieved November 22, 2017. Crehan, Herb; Nowlin, Bill. "Carl Yastrzemski". SABR. Gammons, Peter (September 1981). "Yastrzemski Recalls His Most Memorable Games". Baseball Digest. Vol. 40 no. 9. ISSN 0005-609X. Petrocelli, Rico; Scoggins, Chaz (2017). Tales from the 1967 Red Sox: A Collection of the Greatest Stories Ever Told. Sports Publishing. ISBN 1683580508. Yastrzemski, Carl; Hirshberg, Al (November 1967). "Behind the Red Sox Turnaround". SPORT. Archived from the original on July 4, 2008 – via Wayback Machine. Yastrzemski, Carl; Hirshberg, Al (1968). Yaz. Viking Press. ISBN 0670793019. Yastrzemski, Carl (1990). Yaz: Baseball, the Wall, and Me. Doubleday. ISBN 038526769X. Wikimedia Commons has media related to Carl Yastrzemski.